Antarctica may be a virtually uninhabited, ice-covered landmass with insanely frigid temperatures, but that didn't deter Texas Motor Speedway from finding a race fan on the barren southernmost continent that is home to the South Pole. 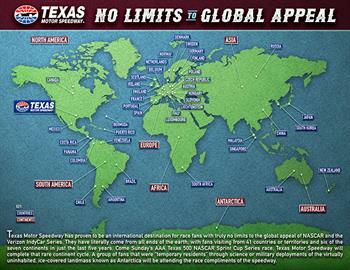 In the past five years, Texas Motor Speedway has had fans visit for its NASCAR and Verizon IndyCar Series races from 41 countries and territories as well as six of the seven continents. The one missing for the speedway to hit for the continent "cycle" was naturally Antarctica. Since there are no full-time residents of that continent, Texas Motor Speedway went on a "search and reward" mission a week ago through traditional and social media to identify "temporary residents" of Antarctica as a result of extended time on the continent through military or scientific deployment. The speedway was offering a free VIP race-day experience for two that included Victory Lane Club suite tickets to the AAA Texas 500, garage passes, pre-race concert passes for country artist Jake Owen, VIP Sprint Cup drivers' meeting passes and some speedway merchandise. Texas Motor Speedway had more than a dozen people reach out about their time in Antarctica and three have confirmed plans to attend Sunday's AAA Texas 500. Two will be traveling to the event - one from North Carolina and another from Michigan - while the other is a local resident in Flower Mound. "We're looking forward to having them visit and giving them a 'No Limits' type of VIP experience for helping us achieve our goal of having fans from all seven continents visit Texas Motor Speedway in just the past five years," Texas Motor Speedway President Eddie Gossage said. "I wouldn't be surprised if Texas Motor Speedway is the only speedway in the world in the past five years to accomplish that feat with Antarctica being the rare gem of the seven continents." Jeff Frye, of Flower Mound, Texas - Frye was assigned to the Naval Support Force Antarctica's "Operation Deep Freeze" on three separate deployments from 1982-85. He was assigned to McMurdo Station the first half of his initial deployment and William Field for the second to manage flight operations. For his second visit, he was selected to replace the lone air traffic controller stationed at the South Pole and assumed those responsibilities at William Field. His final trip was a return to William Field, where he and a group of others relieved the 20 people "wintered over" at the South Pole and handled flight operations. "South Pole Station was a barren, desolate place," Frye said. "The atmospheric pressure was like living at 10,000 feet. It was quite a challenge just acclimating to that as well as temperatures at the South Pole Station ranging from about minus 100F to minus 20F. Being an avid golfer, I dubbed it Pebble Beach South. It was adorned with a large billboard leaving no doubt that golf was of utmost importance there. I had golf clubs and an assortment of golf balls that were hit out into the tundra, never to be found." After nine years in the Navy, Frye spent 21 years with the Federal Aviation Administration before retiring and now working as an ATC Technical Specialist with Flight Research Associates. Dr. Kimberly (Shillcutt) Tyree, of Clemmons, N.C. - Tyree lived in Antarctica from December 1999 to February 2000, with the majority of time at McMurdo Station as well as spending 24 days camping in a tent at Elephant Moraine. Her team from Carnegie Mellon University's Robotics Institute ran tests to prove that the Nomad robot could autonomously locate and identify meteorites on the ice. Her primary role was developing and running the software for the robot's path planning, combining complete coverage algorithms with optimal solar power generation. After Antarctica, Dr. Tyree moved to Houston to work at NASA's Johnson Space Center. "I'm very glad to be part of the Texas Motor Speedway's attempt to host fans from every continent, and proud to represent Antarctica," Tyree said. Glen Schoen, of Hermansville, Mich. - Schoen worked for the Scientific Research Corporation as an electronics technician servicing weather equipment at multiple remote sites for 11 summer seasons from 2000-11. He also maintained navigational aids and communications for McMurdo Station and the South Pole. He spent approximately 60 months on what he calls "ice time" and has 11 certificates for his South Pole tenures. Gossage will be joined by Frye, Tyree and Shoen for a press conference 10 a.m. Sunday in the infield media center to present them with their VIP packages as well as hear their experiences about Antarctica.